She lit the candles and incense, and sat down upon the cushions. Breathing deeply, she inhaled the fragrant scent, and allowed her gaze to wander over the items on the altar. She tried to focus, her gaze finally resting upon the image of Brighid, and the flame that the goddess held in her hands. As the darkness fell, both within and without, both figuratively and literally, she focused on the flame being offered. She took it within her heart, and for a brief moment it flickered, then died out as the darkness consumed it in a deep blanket of despair. She sat for a moment longer, determined to spend at least ten minutes at her altar. At last, she gave up and blew out the candles, allowing the incense to burn itself out. Make tea, the goddess had said. Alright. Let’s make some tea. She went downstairs and put the kettle on. Let’s make tea, she said to herself. Mindfully. She prepared the small teapot with herbs known to lift the darkness and soothe the nerves: St John’s wort and skullcap. She also added some lemon balm, to ease tension and also for flavour. She inhaled the scent of the dried herbs, and mixed them together before placing them in the teapot. She looked out the window in the light of the setting sun, a small muntjac deer feeding alongside a magpie underneath the bird feeder. She placed on a tray the teapot, strainer and saucer, as well as a small handmade earthenware cup. She brought these to the table, and laid them down with her full attention. The kettle had boiled, and she carefully filled her small iron kettle with the water, feeling the steam against her skin. She brought the iron kettle to the table, and placed it on a heat-proof mat. She sat down, her mind still battling the darkness around the edges, her thoughts seemingly not her own. She knew her hormones were swirling in a dance similar to that which she had experienced at adolescence, though now she was at the other end of the brilliant spectrum. She had to take care of herself, of her body as well as her mind. She opened up the teapot and breathed. Mindfully, she took the iron kettle and filled the teapot with water, replacing the kettle with equal attention. She inhaled the scent of the herbs, and replaced the teapot lid. No other thoughts entered her mind, just these simple, small actions. Working with mindfulness, working with full attention to her actions, there was only the present moment. She sat back and waited for the tea to brew. Slowly, she felt the darkness returning, crowding at her mind. Despair at the state of the world, at the constant struggle she faced with work, with others who could not do the simplest of tasks, with expectations from both strangers and friends, knowing that if she didn’t do something, no one would – stop. Breathe. Focus. Three minutes stretched to an eternity as the brew steeped in the teapot. She took a deep breath, and the darkness receded an inch. She picked up the teapot, and concentrated on pouring the tea through the strainer into the small bowl. She kept up her concentration on her breath and on the pouring, and it filled her entire being. Nothing else mattered in that moment. Just pouring tea. She put down the teapot and picked up the cup. The scent of the herbs brought back memories of a wonderful little shop called StarChild in Glastonbury. She allowed the brief memory to flicker, and then she refocused her attention on the cup in her hands. The heat radiated through the bowl, and she had to pick it up carefully, her fingers near the cooler end of the rim. Quietly, she took the first slurp, allowing the air to cool the hot water before it reached her tongue. She concentrated on nothing but drinking the tea, sitting alone in the dining room, with night falling outside. She drank the first cup, and then brewed another in the teapot. She kept her mind focused on the present, acknowledging past wounds but not allowing them to flavour the present moment. She had worked hard to name them and transform them, and was working on it still. Three minutes again slipped past, and outside her dining room window she saw the Christmas lights from the house across the street go on. She poured herself another cup, and drank it mindfully. A third cup was brewed and drunk, and when she finished she sat back and bowed to her tea set. She felt a little better, the darkness within relenting, though not wholly gone. She acknowledged and allowed the herbs to do their work on her body and her mind. With equally careful attention, she rinsed the kettle and washed the teapot, bowl and strainer, and then went upstairs with a lighter heart, to Skype with her mother and find even more comfort and peace, there in the moment, utterly in the moment. My herbal blog – it’s been a while! After a busy autumn, winter and spring I’ve finally had a chance to put up a new blog post on one of my other blogs, The Druid Herbalist. Do check it out and feel free to subscribe to be kept up to date on all future posts! With the hawthorn in full bloom, it’s time to celebrate the wonderful properties that hawthorn and other herbs can provide for our circulatory system. As always, please talk to a qualified herbalist before taking any medicine, as there may be contraindications, especially if you are pregnant or are already on medication. Hawthorn is a good heart tonic, beta blocker, protects the heart muscle, prevents heart attacks, is a vaso-dilator (peripheral), helps promote sleep and is the best herb for blood circulation. It regulates low blood pressure, steadies the heartbeat and lowers cholesterol. It contains chemical compounds that keep blood vessels open, and it vital where vessels lack tone and are inert due to fatty or calcium deposits. It lessens pain in the heart and adjacent areas, re-elasticates blood vessel walls (through rutin), rebuilds collagen fibres in outer layers of vessels and is a powerful anti-oxidant, as well as being rich in vitamin C. It reduces inflammation, relaxes the smooth muscles of the uterus, intestines and other areas to relieve congestion and reduces water retention (bloating before period). It also aids digestion and eases sore throats. This herb is to be used as a tea, syrup (berries) and as a tincture. *Not to be used with other beta-blockers or heart drugs/herbs. Please consult a qualified herbalist if on heart/blood pressure medication of any kind. Cayenne is a brilliant styptic (stops blood flow from wounds). It equalises blood pressure and is good for heart attack or stroke victim recovery as it strengthens the heart and improves circulation. It dilates the arteries and protects from damage. It aids in heat tolerance, stimulates endorphins and is a good treatment for migraines (prevention and cure). It also reduces the tendency for blood clots. It aids digestion, is a cathartic and also relieves sore throats. This herb can be used in cooking, in capsule form (powder) or as a tincture (HOT!). *There are contra-indications with this herb, especially for asthma sufferers. Click HERE to read about more herbs for the heart and to see the full article. Working on my materia medica, creating my own herbal as part of my 2 year journey with Herbcraft professional diploma course, associated with the Association of Natural Medicine. Here’s the second herb I chose for my own personal herbal – if you’re interested in the green and growing world, come one down to my other blog at The Druid Herbalist! Leaves, buds, rhizomes and roots. Collection season: early spring for leaves and buds until they flower, seeds and roots in autumn. Soil and Environment: Universal throughout British Isles and most of temperate world, found in forests, woods, river banks, under shrubs and bushes, wasteland – pretty much anywhere. Thrives in nitrogen-rich soil. Up to 5ft tall, with long jagged edge to shield-shape leaf that comes to point at tip. Stinging hairs along leaves and square stalks. Small, creamy-green flowers in long strands, seeds not long after flowering. An Anglo-Saxon sacred herb (wergulu) and used in medieval times as beer to treat rheumatism. Tibetans believe their sage and poet, Milarep (AD 10252-1135) lived on nettle soup until he turned green. 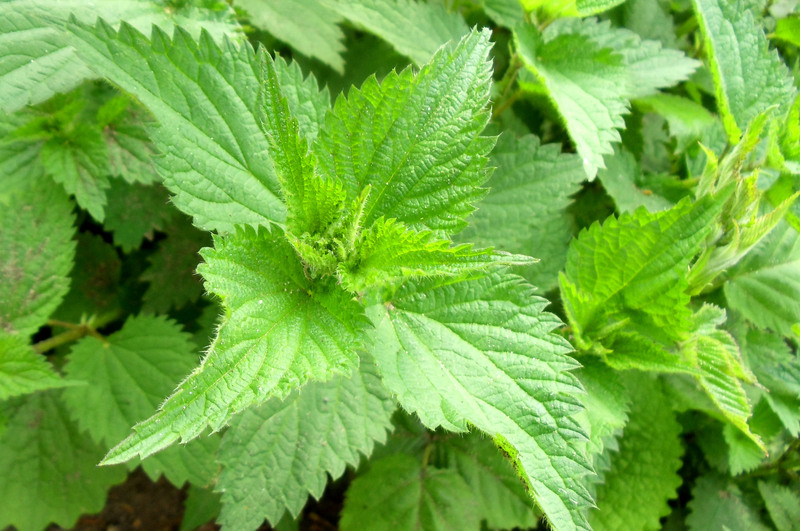 Nettle tops were used as a rennet substitute in cheese-making as they turned milk sour. 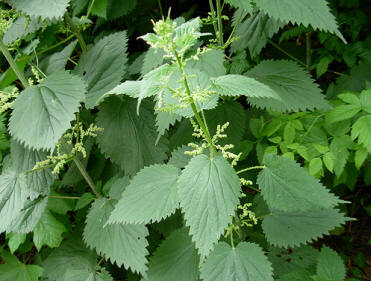 There are around 500 species of nettle. Chlorophyll, vitamins A, B complex, C, D, E and K, folic acid, minerals, bioflavinoids, seretonin precursor. Reduces fatigue, improves stamina, nourishes kidneys, adrenal glands, nourishes immune, digestive, endocrine and respiratory system, increases metabolism, normalises weight, eases/prevents rheumatism and arthritis, good for skin and hair, eases lung complaints such as asthma. Galactagogue. Eases leg cramps and muscle spasms. Reduces haemorrhoids. Anti-inflammatory, alterative, astringent, haemostatic, circulatory tonic, diurectic. Can be used to “boost” many other herb actions, especially when dealing with immune system. Tea – 2 tsps steeped (dried) or 3 tsps (fresh) in boiled water for 5 to 10 mins three times a day. Tincture is 1 tsp twice a day. Protection, self-respect, resiliency and flexibility. Teaches of healthy boundaries while providing deep nourishment. Good meditational tea and also cleansing/purifying bath before ritual.